Today I have the pleasure of introducing Charlotte Ashley, adventure fantasy author and bookseller and, now, anthology publisher! I met Charlotte online (where else?) over on SFFWorld.com when she joined the forum to participate in our contests. Her writing is smart, funny, and entertaining. I have no idea why her work isn’t in every store yet. For the forum anthology, I snatched up her wonderful story Fold, a science fiction super hero story that is sure to not only entertain, but leave you feeling smarter. Check it out in our Lucky or Unlucky? 13 Stories of Fate collection of short stories. Recently, she and a group of her Wattpad friends published their first anthology, Library of Dreams. She’s here to tell you all about it. White: Welcome to my blog, Charlotte! 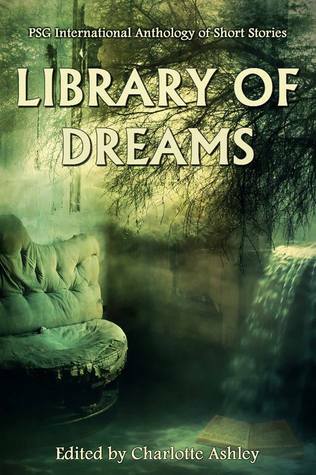 Can you tell my readers a bit about yourself and what precipitated Library of Dreams? Ashley: Thank you for having me! My background is as a bookseller, blogger and book historian. I had written essays and articles about the publishing industry for years, while writing a fantasy novel on the side, in secret. That book was okay, but it was when I decided to try my hand at short stories that I really found my feet. I went from writing in secret to being deeply involved in three writing communities, workshopping, beta-reading, and editing dozens of short stories per month. I started reading slush (and now editing) for Lakeside Circus and writing reviews of some of the 50+ SFFH stories I was reading each month. I’ve become a real advocate for the form, so when one of my writing groups started tossing around the idea of publishing a collaborative project, I jumped on it. We decided to showcase our work for charity, and the Library of Dreams was born. White: What can a reader expect to find in Library of Dreams? Ashley: Because the writers involved come from a variety of literary traditions, we picked a theme that was open to the widest possible interpretation, and that’s what we got. While the majority of the stories fall broadly under the “speculative fiction” umbrella, there are also a couple of straight-fiction stories, one non-fiction and a thriller in there as well. A number of the stories straddle reality: they take place in dream-space, and what is or isn’t real is intentionally obscured. There is a lot of vivid imagery, a lot of strange notions and a few curve balls. Like dreams, they often defy simple description. I was surprised how much variety we got! White: So what’s PSG Publishing all about? Ashley: PSG was originally a publishing support group I was asked to join – an extremely diverse bunch of people who had only one thing in common: we all hoped to publish our work some day. Since the group’s formation, members published both traditionally and by themselves, and we have worked up a pretty impressive skill set. New projects draw heavily from the group’s connections and experience. It was a short hop from sharing things informally to setting ourselves up as a publisher formally. White: I see you have a rather large following on Wattpad. How long have you been active on that site? Ashley: Slightly more than a year. I joined when Margaret Atwood announced Happy Zombie Fun Home, thinking if it was good enough for Ms Atwood, it was good enough for me. I put the novel I had completed up and jumped in with both feet (as I tend to do with everything). It has been a very interesting learning experience. I was fortunate enough to be included in their Featured Author program, which pipes a lot of readers my way. But these are silent readers who do not buy books, so those numbers don’t necessarily translate into, say, sales. What Wattpad is really great for is community. If you’re willing to put the time into the communities, there is a core of very loyal, very active writers who are always up for a writing challenge. I wrote my first-ever short story for a Smackdown-style challenge on Wattpad. I am a person heavily motivated by competition! White: Any advice/warnings for writers thinking of wading into Wattpad territory? Ashley: Wattpad is not a great place to sell books – the readership tends to be people who can’t buy books, either because they are too young to have credit cards or because they live in places where books are expensive and hard to get. It is a good platform for testing your writing out, building a fan base, and connecting with other writers. It is a very good place for finding writers outside of your usual comfort zone. The readership is mostly very young or very international. If you need a place to dry-run a new work or just see if it will resonate with the average writer – Wattpad is your place. But it takes some work to attract those readers, like anywhere. White: What brought you to SFFWorld.com? Ashley: I actually found it while running a search for “fantasy submissions”, before I’d heard about Duotrope or the (Submission) Grinder. I poked around a bit, but when I saw that the writing forum had monthly writing contests, I was completely sold. At this point, I had entered and won pretty much every writing contest I could on Wattpad, and I was looking for a new challenge. Like I said, I am motivated almost entirely by competition. White: I really enjoy your short stories, and now I know you have a novel (or two) hidden away somewhere. When can a fan expect to read those novels? Ashley: Ha! Well, I have a completed YA fantasy novel, Bazza’Jo, up on Wattpad. This was my second completed novel and I am sentimental about it, but I also recognize I have grown as a writer since it was written. My current novel-in-progress is a slipstream/fantasy epic which is safe on my laptop. I’ll try to find a traditional publisher for it when I’m happy with it. One of the biggest thing I learned putting Library of Dreams together is that publishing is a lot of work! I’m daring to dream that a publisher will do all that work for me when my time comes. White: Care to share your most precious Dumas-inspired possession? Ashley: The easy answer is the purse – a leather-bound copy of The Three Musketeers re-purposed as a handbag by Rebound Designs. But if my house was burning down, I’d probably reach first for my 1846 edition of Le Comte de Monte-Cristo. The only book I have that was published during Dumas’ lifetime! White: Anything else you’d like to share with my readers? Ashley: I just want to offer one last shout-out to the Library of Dreams contributors! For a lot of them, this was their first foray into writing short stories, and I made them work for it! The procession of workshops, revisions, edits and more revisions was probably a little soul-destroying for some of them, but the result is something I am really proud of. You guys bled for it, and it was worth it! White: Thank you for your time, Charlotte and for those looking to dip into some dreams, snag your copy of Library of Dreams on Amazon.com in digital or print.